I sit down with Bob Knakal, the founding partner and Chairman of Massey Knakal Realty Services, who sell more commercial properties in New York City than any other firm. In 2009, Real Estate Forum magazine named Mr. Knakal one of the top 10 investment sales brokers in the United States. He’s also a prolific commentator on the commercial real estate economy. Check out his blog StreetWise which is an initiative of his firm and GlobeSt.com as well as his weekly commentary in the New York Observer’s Commercial Observer. His recent State Shouldn’t Make a Whole New Ball Game of Mitchell-Lama is mandatory reading (no, not because of the Yankees World Series analogy). I have long admired his market insights and his hair. We have a great conversation. After a year of hard work burning the midnight oil seven days a week, I was able to move up one position to 86. Goal met. Life is good. Hey, I’m the only appraiser on the list. I hear that 1,000+ people are registered to attend the Observer Living event (although I think the room where we are speaking is half that size). Tomorrow morning at 7am on Bloomberg Radio am 1130 – I’ll be the first guest on Bloomberg Surveillence with Tom Keane and Ken Prewitt to kick off a show on the housing market. I listen to the show via podcast nearly every day – always interesting. In late January I was interested in purchasing a suit. A regional department store was having a 50% off sale on men’s clothing so I thought I’d go take a look. I found a suit I liked which retailed for $795 less 50%. Once I had it fitted, I took the suit to the register where it was scanned and I was told the price was $39. The store clerk proceed to explain a myriad of 50% off of 40% off of 70% off of 20% of the retail price less an additional 10% and on and on. The employee seemed a little embarrassed but was adamant the price was correct even though it was less than my alterations. NO ONE WAS IN THE STORE. If this scenario occurred two years ago, it would have been like a scene from the movie the “300” with carnage and piles of bodies clamoring for the last suit on the rack. And that’s what is wrong with the economy right now – it’s not all about price. It’s also about confidence. I asked the clerk to hold the suit while I went and bought 4 more as well as other accessories for similar discounts. I ended up spending what I intended to in the beginning, but got about 20 times the merchandise. As I walked out of the store, I felt miserable, convinced more than ever the wheels were coming off our economic wagon and that this type of discounting was not free – we would end up paying for it in other ways. I have been including this experience into (aka weaving them into the fabric of – sorry) most of my speeches as of late because I think it captures the essence of what’s going on at the moment. But I still like the suits. On Thursday there was a widely viewed and discussed research letter by Goldman Sachs covering the Manhattan housing market. Lockhart Steele at Curbed first reported it on Thursday, followed by the WSJ on Friday. I thought Lock broke it down thoroughly — Curbed style — and there was nothing more to it. Later, I got about a bunch of emails asking for my thoughts on the research note so I thought I would take another look (since my work is part of their commentary). I placed the full text of their research note at the bottom of this post. Frankly, I thought the Goldman research letter was surprisingly thin, with weak logic and a bit self-serving since Goldman was the first licensee of the S&P/Case-Shiller Home Price Indices. Goldman uses the phrase “these types of arguments are difficult to quantify and are often heard just prior to a real estate market downturn” twice in this paper. Gotta love boilerplate! Goldman criticizes the “brokerage reports” for not considering price per square foot since the firms publish mean and median prices for both co-ops and condos on a quarterly basis, but these are difficult to interpret due to significant changes over time in the size and quality of apartments being sold. Of course the report I prepare as well as my competitors’ reports all use price per square foot as a basic price metric. I was the first to do this many years ago for the co-op market. Goldman alludes to one of the research companies cited as having only one year of price per square foot data. Of course Goldman forgot to mention our reports contain price per square foot data going back to 1989 broken out quarterly and annually by number of bedrooms (size) and property type (co-op, condo and 1-5 family). Goldman relies on only matched price observations involving successive transactions in the same condominium for estimating the overall change in prices. This is actually a logical point. Since about 38.3% (in 4Q08) of condo sales were from new developments, using them as a basis of establishing a trend would reflect market conditions 12-18 months ago when the typical contract was signed. Any report or index that does not extract new development from the condo sales data can be as much as 12-18 months behind the market. I have found re-sale activity to be more reliable for establishing condo price trends which is something that can be captured using the CSI repeat sales methodology, despite many reservations that I have. Goldman uses the CSI index (which covers all of New York City, not the individual boroughs) yet analyzes income in Manhattan to establish ratios for affordability. This is perplexing to me since prices in the outer boroughs are half their equivalent in Manhattan. With the way this part was written, I get the feeling that using the CSI index was simply easier to plug into their ratios. In short, I see this research note is more of a “puff piece” using the “faith and credit” of Goldman’s brand to hump the new Case Shiller condo index which was why I didn’t pay much attention to the Goldman report when initially released. I understand it is not a white paper, nor was it meant to be backed up by lots of footnotes and appendices. However, the fact that it was released by the gold standard of (former) investment banks, is a bit disappointing. We use the recently introduced S&P/Case-Shiller index for condominium prices to assess the valuation of the New York apartment market. Although housing market valuation typically has little predictive value for the near term, it is useful for anticipating longer-term moves, especially when prices are far away from equilibrium. Indeed, New York apartment prices are very high relative to the observable fundamentals. Using three alternative yardsticks—price/rent, price/income, and affordability —we find that prices would need to decline by 35%-44% to return to the valuation levels seen in the 1995-1999 period, before the start of the recent boom. The uncertainty is substantial. On the one hand, the picture would worsen further if per-capita incomes in Manhattan returned from their current level of 3 times the national norm toward the pre-1990s average of 2 times the national norm. On the other hand, it would brighten somewhat if jumbo mortgage rates converged toward conforming rates, perhaps because of a broadening of the Fed’s support measures. In addition, societal and demographic changes could also help, though these types of arguments are difficult to quantify and are often heard just prior to a real estate market downturn. Following a decade-long boom, activity in the New York City apartment market is now slowing sharply. The sales reports for the fourth quarter of 2008 released on Monday by two of the largest New York real estate brokers—the Corcoran Group and Prudential Douglas Elliman—suggest that sales dropped by 25%-30% from the fourth quarter of 2007 (see “Striking Declines Seen in Manhattan Real Estate Market,” New York Times, January 6, 2009, page A20). Although the prices of closed sales were little changed from a year earlier, one analyst estimated that the prices of apartments that were under contract but had not yet closed fell by 20% from August to December. Moreover, it is well known that prices lag sales activity in the housing market, so most observers agree that both contract and closing prices are likely to decline in the near term. 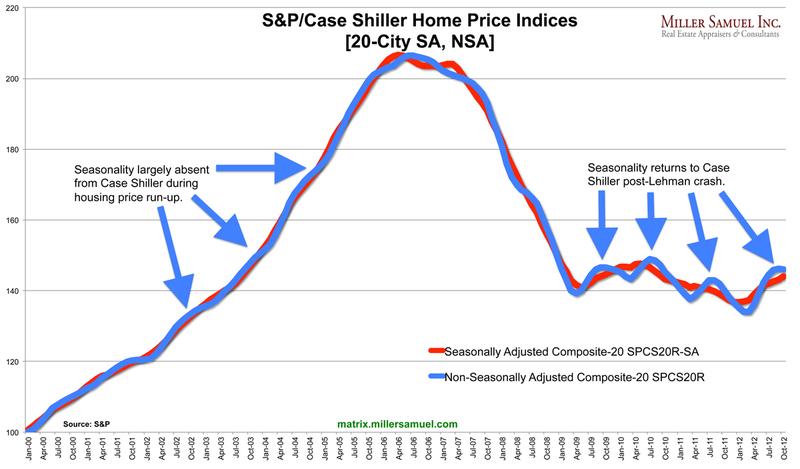 Information on sales and price momentum is very helpful for predicting near-term moves in the real estate market. But in order to gauge the longer-term outlook, it is better to look at fundamental valuation indicators, such as the level of prices relative to rents or incomes, either directly or adjusted by mortgage interest rates. These types of variables don’t have much predictive power over the near term, but they start to become much more powerful at horizons longer than 1-2 years. Until recently a fundamental analysis of the New York apartment market was hampered by the lack of high-quality price data. The various brokerage firms publish mean and median prices for both co-ops and condos on a quarterly basis, but these are difficult to interpret due to significant changes over time in the size and quality of apartments being sold. 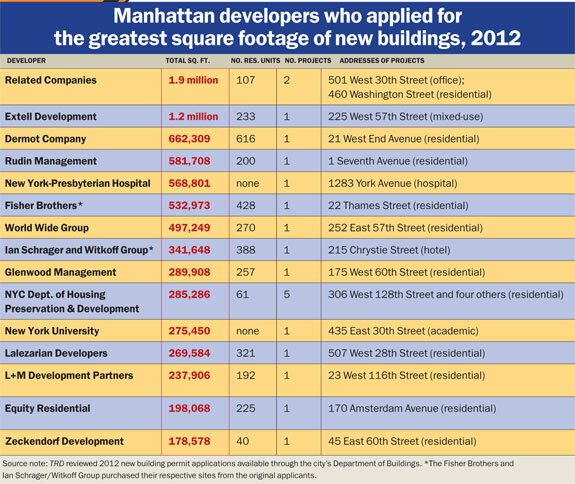 In addition, research firm Radar Logic, Inc., publishes a “price per square foot” series for the New York condo market. However, there is only a year’s worth of history, and changes in the average quality of homes sold can still distort the data even though the Radar Logic approach does control for variations in size. But the data situation has improved dramatically with the recent broadening of the S&P/Case-Shiller (CS) repeat sales home price index to cover five of the nation’s largest condominium markets, including New York. These indexes stretch back to 1995—not as far as we would like but much better than what is available currently—and they adjust for changes in both size and quality of the condos by using only matched price observations involving successive transactions in the same condominium for estimating the overall change in prices. Admittedly, a repeat sales index does not perfectly adjust for quality changes. In theory, the bias could work in either direction. On the one hand, wear and tear will reduce the value of a given condominium over time if the owner does not look after the property well. On the other hand, upgrades such as new flooring or a nicer kitchen may raise the value. While the CS index seeks to eliminate the influence of these factors by downweighting price change observations that are far out of line with local comparables, this is unlikely to eliminate all sources of bias. Still, we believe that a repeat sales index is far superior to the available alternatives for the purpose of measures changes in underlying real estate prices. In analyzing the data, it is useful to look first at the raw numbers for New York condo prices. As shown in the table below, nominal prices tripled from 1995 to 2006, went essentially sideways in 2007, and have declined by about 3% in 2008. The stability since 2005 is somewhat at odds with reports from the New York real estate brokers that still show meaningful gains in mean and median prices over this period. However, we suspect that the apparent contrast is resolved by a shift in transactions toward larger and higher-quality apartments over this period, which would increase the mean and median price figures but leave the CS index unaffected. Price/rent ratio. We divide the CS index by the Bureau of Labor Statistics’ index of owners’ equivalent rent for the New York metropolitan area, and index the resulting ratio to 100 for the average of the 1995-1999 period. We choose this base period because it mostly precedes the recent boom but covers a period when the quality of life in Manhattan had already improved significantly from the 1980s and early 1990s. Hence, a return to the average 1995-1999 valuation level might seem like a fairly neutral assumption. Affordability. Using a standard mortgage calculator and assuming both a jumbo mortgage and a 30-year maturity, we calculate (an index of) the share of Manhattan per-capita income spent on condo mortgage payments at the current level of the CS index and the current level of jumbo mortgage rates. We again index the resulting ratio to 100 for 1995-1999. The table below shows what all three of our indicators say about the current valuation level, as of October 2008. We focus on the percentage decline in nominal condo prices that would be required to bring our three valuation measures back to the 1995-1999 average, assuming no changes in other inputs such as rents, incomes, and mortgage rates. *In order to return to 1995-1999 valuation levels. Source: Our calculations. See text for additional explanations. Since economies typically grow over time, one would normally hesitate to predict that “mean reversion” in a price/income or price/rent ratio should occur entirely via a decline in prices rather than an increase in incomes or rents. In our case, however, the assumption of flat nominal incomes and rents does not seem excessively pessimistic. In fact, it is quite possible that nominal Manhattan incomes will decline for a while. Such a nominal decline would be extremely unusual at the national level but did occur in Manhattan following the 2001 recession, which was much less severe than the downturn we are currently seeing. So is there any hope for the New York apartment market? Apart from a dramatic turnaround in the city’s economic fortunes, the most plausible story is a drop in jumbo mortgage rates. So far, jumbo rates have not benefited much from the recent decline in mortgage rates, but this could change if the Fed (presumably in conjunction with the Treasury) decided in the course of 2009 to broaden its support from the conforming market to the private-label mortgage market. To make an extreme assumption, if the jumbo mortgage rate fell from the current 7% to 5%, this would reduce the “required” price decline from 35% to 19%. Of course, this assumes that affordability is the only measure that matters for home prices and there is no role for the “raw” price/rent or price/income ratio, and that Manhattan incomes stay at 3 times the national average. In addition, it could be that societal and demographic changes will keep New York apartment valuations above the levels that prevailed in earlier periods. For example, one might argue that the memory of high crime rates was still fresh enough in 1995-1999 to make this period an excessively pessimistic benchmark. If crime stays low during the current economic downturn, perhaps Manhattan real estate will retain its higher valuation in coming years. Alternatively, one might argue that the aging of the baby boomers will continue to support the New York market as “empty nesters” want to live closer to the city’s attractions. These types of arguments are difficult to quantify and are often heard just prior to the start of a real estate downturn, but they do underscore that our analysis of the observable data on prices, rents, incomes, and interest rates only provides a very partial view of the New York apartment market.